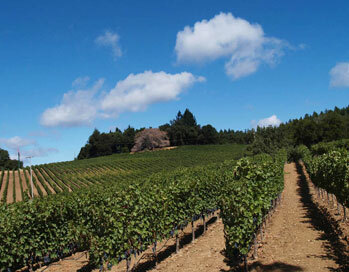 Silver Cloud Ranch in Sonoma County's premiere wine region. On the slopes of Mt. 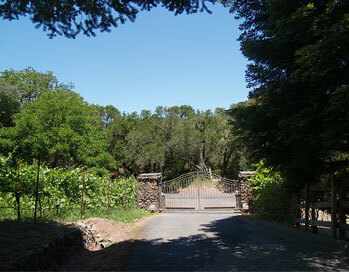 Veeder at 2000 ft elevation, this 160 +/- acre ranch includes 11.5 acres of producing Cabernet vines. This prime hillside fruit is crafted into an award-winning vintage by one of Napa's renowned wine families and will allow you to create a family label, or continue to sell the crop. Also, up to 95 additional acres plantable with Crop Care analysis completed. Big open bowls and forested areas add recreational opportunities and additional building sites. Land potentially could be divided into 4 parcels. Stunning views over the Sonoma Valley. Lovely 1910 farmhouse offers character and charm. In the Napa Valley Appellation, this 121+/- acre property is truly one of the most beautiful ranches on the market today. Nestled in a secluded private valley, the gorgeous oak-studded meadows and lovely lakes wrap around prestigious neighboring vineyards and capture elegant hillside vineyard views. Contiguous to Aetna Springs Resort, 80+/- acres possibly under 5% slope and available for immediate planting to vineyard, orchard. Island Lake and Lower Lake provide 46-acre-feet of water for your use, plus bonus water from dedicated spring. Amazing building sites! Ideal for large family compound or corporate retreat, this one-of-a-kind property has 15 potentially plantable acres in desirable Howell Mountain Appellation. Contemporary yet traditional generously proportioned living and dining rooms with fireplace, multiple French doors that open onto entertaining decks with beautiful lake views. Gorgeous custom wood work throughout. Large chef's kitchen with fireplace adjacent to sun room. Built-in library/study. Upper level offers huge master suite with sitting area, balcony and fireplace. Total of 11 bedrooms, including separate guest house and large studio/au pair suite. Storybook wine country setting on two acres – in the vineyards. 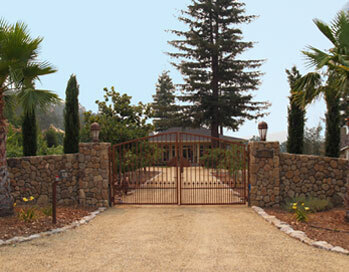 Premium Cabernet vines and majestic redwoods surround the plantation-style farmhouse and guest cottage. Wrap around covered veranda, picturesque grounds with park-like lawns and reflective in-ground lap pool. Comfortably elegant main home offers high-tech amenities, warm Brazilian cherry floors, custom finishes, wood cabinets and abundant storage, marble fireplace, chef’s kitchen and bathrooms. Stunning views from master suite. Charming cottage with firplace. Two-story barn offers potential living space. Located on the most desirable private road in Angwin, contemporary remodeled home offers unmatched views of Napa Valley vineyards, and panoramic views extending from Lake Hennessey to Mt. Diablo to San Francisco to Mt. Tamalpais and Mt. Veeder. Property is contiguous to world-class winery. The 5 bedroom, 3 bath home has wrap around deck with hot tub, outdoor living and garden areas. Features window walls, maple floors, fireplace, two 2-car garages, wine storage, outdoor kitchen with built-in barbeque, wrap-around deck and hot tub. Terrace level has separate entrance: perfect for guests or private office. Turn key and ready to relax, this fully renovated, contemporary post-modern stunner is located in the prestigious Silverado Country Club residential community. Every detail has been accounted for here. 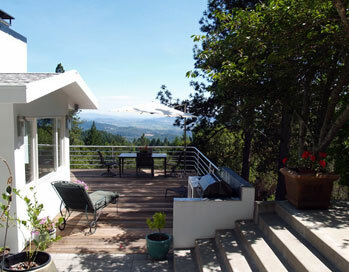 Featuring all the luxury and convenience of Wine Country living and entertaining, this home was designed to be enjoyed. Vaulted ceilings are highlighted by huge clerestory windows that bathe the home in natural light. Two fireplaces, gorgeous granite counters and island, top-of-the-line appliances, single story, generously wide hallways, Italian tile floors, lots of indoor-outdoor access through Andersen dual-pane glass sliders, entertaining deck with hot tub. Lovely home in prestigious Hagen Oaks gated community. Set in elegant gardens which are highlighted by dramatic rock outcroppings and beautiful oaks. Home offers generously proportioned rooms, 4 bedroom suites, each with attached bath, charming French doors that open from all view rooms to entertaining deck or private balcony. Enjoy your evenings outside with panoramic views of mountains, while playing bocce ball or just relax inside with 4,000+ sq. ft. of spacious living. This impeccable home is priced to sell. Dream building site with beautiful approach through vineyard-flanked gated entry then along rock-lined private drive to site. Pastoral setting with pretty views from the land that look back on hills, vineyards and woods. Surrounded by beautiful deep forest, the property offers plenty of open area for an estate home with room for hobby vineyard and pool. 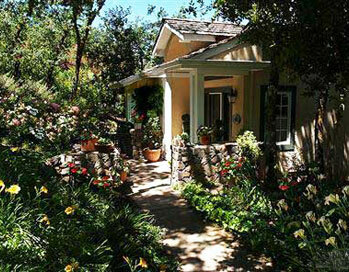 This property is close to Meadowood Resort and offers privacy yet proximity to town. In an area of estate homes and in the limits of City of St. Helena. Wonderful view home with rustic country charm near town. Private lane with vineyard and meadow views, old stone walls and patio. 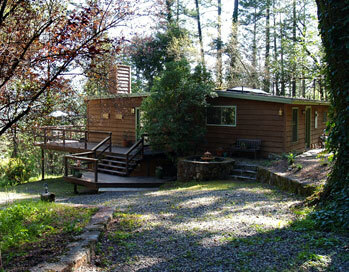 Deck and patio adjacent to an open meadow, dotted with trees. 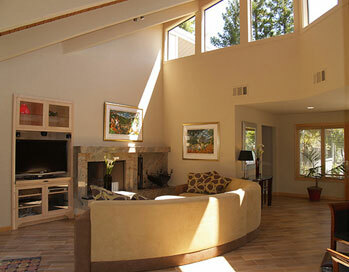 An open floor plan and skylights provide spacious living and lots of natural light. Smartly remodeled kitchen, wood stove in dining room, stone fireplace in living room. Great opportunity for expansion on lower level. Ideal vacation home or live here full time.